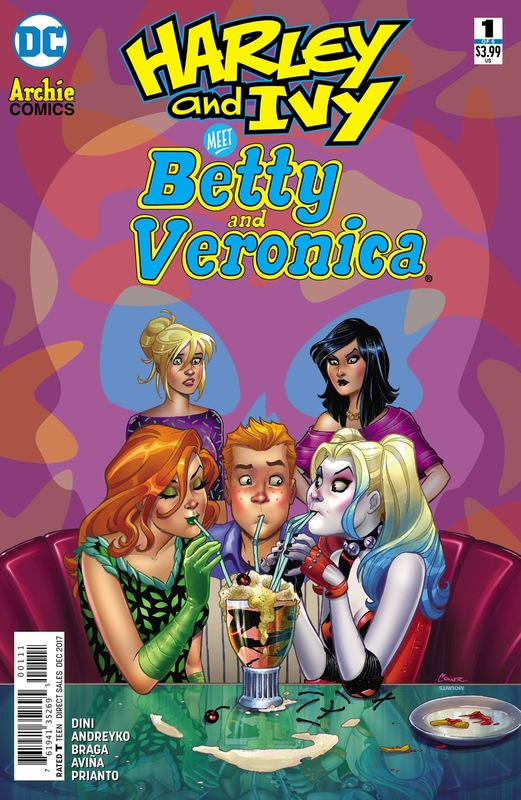 The Fellowship was fortunate enough to obtain a copy of HARLEY AND IVY MEET BETTY AND VERONICA #1 from Archie Comics and DC Comics. The story is by Paul Dini and Marc Andreyko; with art by Laura Braga, colors by Tony Avina & Arif Prianto, and letters by Deron Bennett. Hiram Lodge (Veronica’s dad) has bought Sweetwater Swamp with designs of building a college and shopping mall. Not only will Lodge University have the latest start of the art technology, but courses (heavily leaning toward the darker side of the business world) would be free. The destruction of the Swamp gets Poison Ivy’s attention, so she and Harley Quinn head to Riverdale to stop Mr. Lodge. Meanwhile, the gang is getting ready for the “Heroes and Villains” Gala benefitting the college. A desperate Betty and Veronica take a chance on a particular pair of costumes. What happens when “Harley and Ivy” meet…Harley and Ivy? What a promising start to what could be a fun little adventure. Dini and Andreyko do a great job of making this crossover work be delivering a smart script that is faithful to all the characters. What also helps sell the joining of worlds is the beautiful art by Laura Braga. It will be interesting to see where the story takes the lovely ladies of Gotham and Riverdale, and I’m along for the ride. Check it out! HARLEY AND IVY MEET BETTY AND VERONICA #1 is in stores now or available at www.archiecomics.com or www.dccomics.com.